Much to the surprise of Malaysian voters, polling day will take place on Wednesday (May 9). Voter turnout is expected to be suppressed on a midweek day, even though a one-day public holiday is declared. Malaysia's 13th general election in 2013 points to a bifurcated Malaysia socio-political landscape. Very simply, it was ‘urban for Pakatan’ (the opposition coalition) and ‘rural for UMNO-BN’ (the long-ruling coalition). The unprecedented midweek polling day has raised eyebrows. The worry in the political contest is that outstation voters are affected. They work in the bigger urban areas (the Klang Valley, Johor Bahru, Penang and Singapore) and they tend to be opposition supporters. These voters need to travel some distance intra or inter-state or further including from Peninsular to East Malaysia to return home to vote. Caretaker Deputy Prime Minister Zahid Hamidi is quoted as asking Singapore-based voters not to come back and vote if they can’t get leave. Although this was a practical comment, he was criticised by netizens and activists worried about disenfranchisement. Voters resident in Singapore will be glad of assurance that all Malaysian immigration lanes will be open to facilitate their cross-border movement. Disgruntled voters complain that it will be “Hari Raya and Chinese New Year rolled into one,” expecting road traffic snarl ups. Might that be true? We are working with The Edge Malaysia to set up the Undi Traffic for the 14th general election (GE14) to examine how traffic builds up in Peninsular Malaysia. This review of journey times from the Google Traffic Layer, will come online in just a few days, starting Monday, May 7, 2018. To understand the potential traffic situation on May 8 and 9, we can look to the festive season traffic conditions, especially during Hari Raya Aidilfitri and Chinese New Year. PLUS and Waze data show dramatic declines in traffic volumes in Johor Bahru and the Klang Valley in favour of increases along the northbound segment of the North-South Expressway (NSE), and routes from Kuala Lumpur to Kuala Terengganu, Kota Bahru, Pahang, and Johor. Last festive season saw a 21% surge (over regular volumes) in traffic along the NSE during Hari Raya and 10% during CNY. This translated into an addition of almost 1 million vehicles on the highways during Hari Raya and half a million during CNY. We can expect that GE14 traffic will involve a combination of Hari Raya and CNY traffic. Based on these estimates as well as travellers of voting age and voter registration lists, we expect approximately 1.7 million to 3.5 million voters (between 11-23% of eligible voters) to be on the move in the days leading up to and on polling day. However, the Wednesday polling day may still deter some voters who may find it inconvenient to make a return trip between their hometowns and urban centers within a day or two. Might a million voters (approximately 7% of registered voters) be dissuaded from making the journey while another million struggle to do so under difficult traffic conditions? We will get a better idea about the impact of the Wednesday polling day once voter turnout results are announced post-GE14. 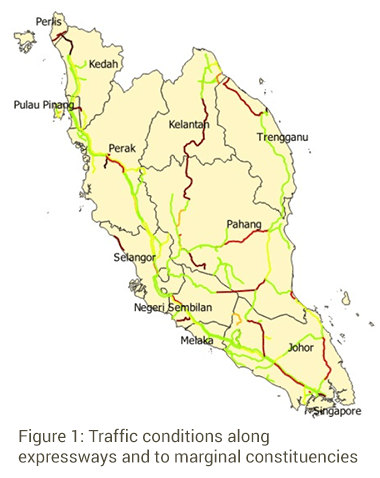 Some of the routes where we expect high traffic volume leading up to polling day include: a) North-South Expressway (both directions), b) East Coast Expressway - eastbound, c) KL-Karak Expressway - eastbound; and d) most of the connecting roads and expressways heading out from the Klang Valley. The usual travel time for some of these routes can range from two to eight hours on a good day and 12 hours during the peak of the festive season. We will be watching the traffic conditions for all major Peninsular highways linking the urban centers of Klang Valley, Penang, and Johor Bahru/Singapore to the rest of the country. Additionally, we will be monitoring some of the contested constituencies (marginal and hot seats). After detailed election results are available, Undi Traffic indicators can be analysed in relation to voter turnout and outcomes in these constituencies.